The Gravely Group has successfully completed the Head Start governing Body and Tribal Council Certification. Many kinds of organizations oversee Head Start programs, including community action agencies, nonprofit organizations, school districts, city or county governments, and tribal governments. 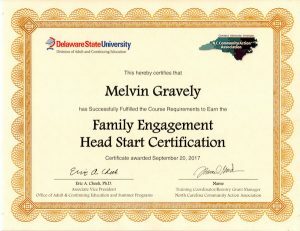 The information presented in this Certification applies to all Head Start grantees, regardless of their organizational structure. This certification included five sections. Learned what Head Start is all about, from its history to the valuable programs and services it provides to children and families. Section 2: What Is Head Start Program Governance? Dig deeper into how Head Start program governance functions. Learned about the Head Start Act and its requirements for governance. Explore the legal responsibilities associated with the governing body or Tribal Council member. Read about the important fiscal responsibilities involved with overseeing a Head Start program. Found tools and resources that can help Head Start governance role. 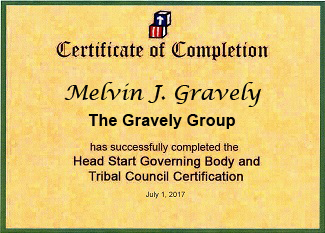 After completing all five sections, participants received a certificate that acknowledges my understanding about Head Start Governing Body and Tribal Council. “Governing Body” refers to all boards, Tribal Councils, and other bodies that are responsible for overseeing a Head Start program.